A month ago, in the Almanac post of October 20, we featured The Nation’s editorial comment on the beginning of congressional hearings investigating the influence of Communism in the American film industry. 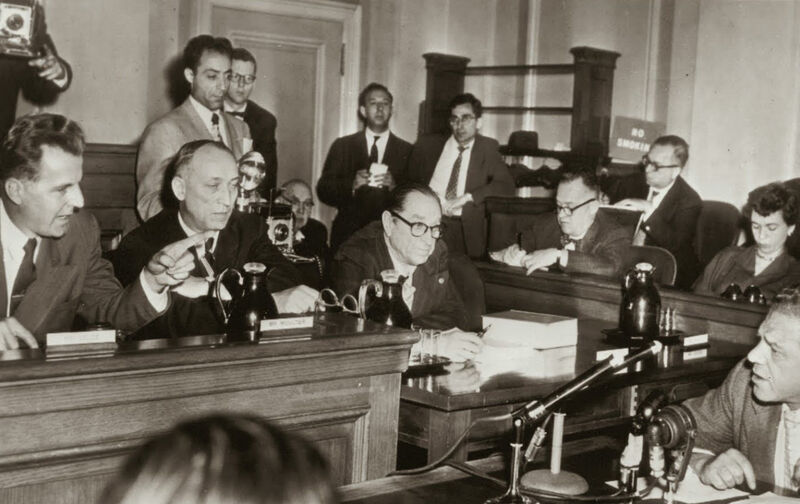 Several weeks after those hearings began, ten Hollywood writers, directors and actors (including Dalton Trumbo, Paul Robeson, Ring Lardner Jr., and Richard Wright) were blacklisted, or banned from working again in film, because they refused to “name names” before the House Un-American Activities Committee. A decade later, Trumbo (the subject of a new biopic), wrote an essay for The Nation about the blacklist, in which he openly flouted how the victims were still doing work on films but weren’t getting the credit they deserved. A blacklist, far from being a funny thing, is an illegal instrument of terror which can exist only by sufferance of and connivance with the federal government. The Hollywood blacklist is but part of an immensely greater official blacklist—barring its victims from work at home and denying them passage abroad—which mocks our government in all its relations with civilized powers that neither tolerate nor understand such repression. The shock of the blacklist produces psychic disorders among sensitive persons, from which result broken homes, desolate children, premature deaths and sometimes suicide. It is not alone the loss of income or of property that hurts: the more terrible wound is the loss of a profession to which one’s entire life has been dedicated. A director must have the facilities of a studio: denied them, he sells real estate. A violinist must appear in person for the concert: barred from admittance, he becomes a milkman and practices six hours a day against the unrevealed time when his music once more may be heard. The actor’s physical personality, which is his greatest asset, becomes his supreme curse under the blacklist; he must be seen, and when the sight of him is prohibited he becomes a carpenter, an insurance salesman, a barber.